Three projects using AquaGate materials in PRBs have been completed in the last three years. A major advantage of using AquaGate-based materials is ease of handling and construction. 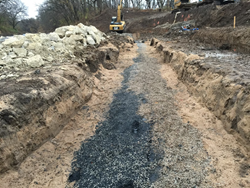 The materials can simply be placed directly into a trench or through water while maintaining uniform distribution of the adsorptive material throughout the depth and thickness of the reactive barrier wall. AquaBlok, Ltd., manufacturer of composite particle materials and recognized provider of a low-permeable remediation technology, has demonstrated their AquaGate-based treatment materials as a way to improve performance, as well as simplify the construction of, a Permeable Reactive Barrier (PRB), which is used to address contaminated groundwater remediation. The ability to uniformly and cost-effectively deliver treatment materials in a PRB provides an important alternative to the industry's historic "default" solution of operating pump-and-treat systems for controlling the spread of contaminated groundwater. In addition, the control of isolated seep zones can be accomplished by using the AquaGate approach in a flexible and simple-to-implement manner. Three applications of AquaGate materials in PRBs have been performed throughout the last three years. The primary objective of these installations was to limit the migration of petroleum-based contaminants into surface water bodies. In each case, multiple AquaGate materials were used to form a "treatment train" approach, enabling the removal of both NAPL and dissolved-phase contaminants from groundwater. A common element to the design of each application was the combined use of AquaGate+Organoclay to remove NAPL and AquaGate+PAC (powdered activated carbon) to address dissolve-phase hydrocarbons. A major advantage of using AquaGate-based materials is ease of handling and construction. The materials can simply be placed directly into a trench or through water while maintaining uniform distribution of the adsorptive material throughout the depth and thickness of the reactive barrier wall. This reduces risk of material separation during construction and enables the use of more reactive powdered materials in construction and installation of the treatment material. AquaBlok, Ltd. is a manufacturer of composite materials utilizing their patented coating and amendment technology. The company has a long history of successful projects in the environmental industry and provides a range of products used in in-situ groundwater and surface water treatment and sediment remediation applications.